Author Junot Diaz and Comic Creator Jaime Hernandez Join Forces in Deluxe Edition of “This is How You Lose Her” : COMICS ARE EVERYWHERE! 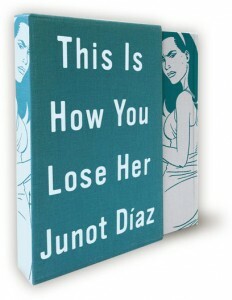 The deluxe edition of Junot Diaz's short-story collection This is How You Lose Her hits bookshelves on Halloween. This Halloween, readers of Pulitzer Prize-winning author Junot Diaz and Love and Rockets comic creator Jaime Hernandez ‘s respective fan bases can look forward to enjoying their collaboration in the deluxe edition of This is How You Lose Her. There is no question that Hernandez’s monochromatic drawings in this slipcase edition of Diaz’s short-story anthology will add a new layer of specificity to the writer’s fictional landscape. The artist’s illustrations of the female characters populating Diaz’s emotional raw tales of infidelity and heartbreak are rendered with his signature drawing chops, delivering select, revealing, visual details that will inevitably impact the reader’s interpretations of the text. The artful mashup of Diaz’s lively, energetic prose and Hernandez’s black-and-white artwork is a perfect marriage of the artists’ postmodern sensibilities. The pairing is apropos since Diaz mines his Dominican heritage with a fervor that echoes the consistent fashion Hernandez’s comics explore his personal connection to the Latino-American milleu and California punk aesthetic expressed by his comic-book characters Hopey and Maggie. Through these overlapping, artistic ambitions, both artists have distinguished themselves in their heartfelt efforts to create a space where stories chronicling slices of Latino-American experiences are allowed much-needed breathing space. Their respective stories are not only engaging and entertaining in how they relish language and imagery, but they simultaneously expand our understanding of these communities that are often ignored. In the process, these artists demolish stereotypes by providing counter narratives embracing self-representation and what it means to be of Hispanic origins in our times. 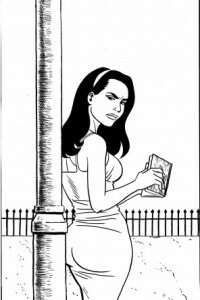 One of Jaime Hernandez's black-and-white drawings gracing the pages of the deluxe edition of This is How You Lose Her. As an artist of color (who is half Puerto Rican), I am an avid reader of both storytellers. The ambition and scope of their creativity gives a voice and presence to these underrepresented communities are inspiring as these artists simultaneously break down barriers and stay true to their roots and their multi-faceted identities. Brief Wondrous Life of Oscar Wao will recognize his recurrent character Yunior who is a frequent protagonist in this collection of short fiction. The text-only version of This is How You Lose Her was originally released last year and it was a finalist for the 2013 National Book Award. In many ways, Yunior’s first-person misadventures in the trenches of love and betrayal are grounded in the fertile territory of realism that is home to the equally complex emotional entanglements swimming through Hernandez’s comic-book stories. Both Diaz’s fiction and Hernandez’s comic-book tales in Love and Rockets are mapping the emotional terrain of human interpersonal relationships seen through a distinctly Latino-American lens. In respects to Comics Are Everywhere!, Hernandez is among the numerous cartoonists whom I’ve interviewed about their sequential art and visual storytelling. And I am hoping that an opportunity will arise when I can convince Diaz to appear on camera to share his observations and insights into how and why comics are impacting artists both in and outside of comic-book circles. 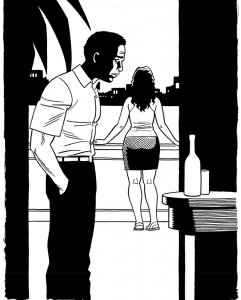 If you are curious to read more about the deluxe edition of This is How You Lose Her, be sure to check out writer-cartoonist Michael Cavna’s interview with both Diaz and Hernandez in his “Comic Riffs” blog for The Washington Post. Here is another notable discussion about Diaz’s darkly funny and moving short stories that are been enthusiastically embraced by critics and adventurous readers alike. Jaime Hernandez is a master cartoonist and his powerful images are ideal for the candor and emotionally raw prose of Junot Diaz's short stories. Needless to say, I look forward to adding the deluxe edition of This is How You Lose Her to my home library where fiction and comics share the same bookshelves in equal measure of importance as sources of reading pleasure.